PT Astra Daihatsu Motor - ADM is a reputable company in Indonesia that is involved in industry. PT Astra Daihatsu Motor operates primarily as a sole agent and brand holding agent (ATPM) of Japanese carmaker Daihatsu Motor Corp (DMC) in Indonesia. PT Astra Daihatsu Motor is the only Indonesian company that has the right to import, assemble and create Daihatsu brands in Indonesia. 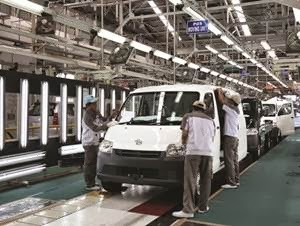 ADM is engaged in the production of Daihatsu and Toyota vehicles in Indonesia. Its vechile models include Daihatsu Xenia and Toyota Avanza, Daihatsu Terios and Toyota Rush, Daihatsu Gran Max, Daihatsu Luxio, as well as Daihatsu Ayla and Toyota Agya. PT Astra Daihatsu Motor is a multinational joint venture company between PT Astra International Tbk (Astra Group), Daihatsu Motor Company Ltd and Toyota Tsuho Corporation. PT Astra Daihatsu Motor is recognized as the largest car manufacturers in Indonesia. According to Astra Group Annual Report 2015 as cited by JobsCDC.com, PT Astra Daihatsu Motor runs its business through 2 assembly plants in Sunter Jakarta and East Karawang with total installed production capacity of 530,000 units per year (equipment and machineries based). Minimum Diploma (D3) holder in Accounting, Economics, Administration. Have a good knowledge about insurance. Have driving license class A (SIM A) is preferred. Minimum Diploma (D3) holder in Mechanical Engineering, Product Design. Expertise with CAD and Art. Minimum Diploma (D3) holder in Electro Engineering, Mechanical Engineering, IT, Administration. Expertise with design software (CATIA/CAD). Maximum age of 27 years old (preferable). Min GPA score 2.90 out of 4.00. JobsCDC.com now available on android device. Download now on Google Play here. Please be aware of recruitment fraud. The entire stage of this selection process is free of charge. PT Astra Daihatsu Motor - D3 Fresh Graduate Junior Staff ADM Astra Group November 2016 will never ask for fees or upfront payments for any purposes during the recruitment process such as transportation and accommodation.